Seasonal Occurrence: Very rare migrant and accidental winter visitor. 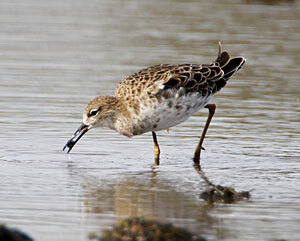 Notes: Ruff is an Eurasian sandpiper which occasionally may be found in the United States. It is a Texas Review species. As of April, 2010, there have been 31 accepted records in Texas. Male adults in breeding plumage acquire dramatic ruffs of neck feathers in colors varying from black to rufous to white. Females are smaller and lack ruffs. 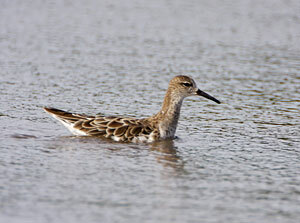 The Ruff (adult in winter plumage) in David McDonald's photographs was discovered off 8 Mile Road on Galveston Island on Aug 31, 2008.